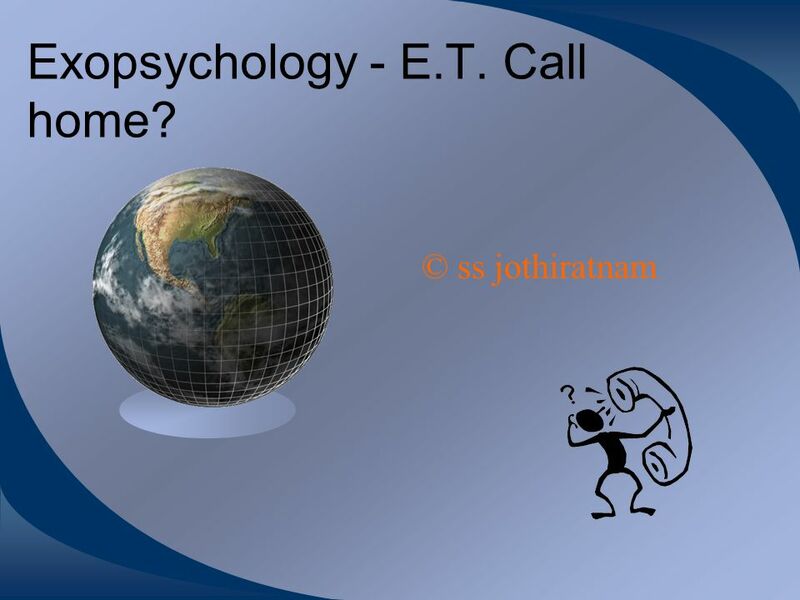 Exopsychology - E.T. Call home? © ss jothiratnam. 2 Last time, I explored the possibility of what extraterrestrials might look like, and at the end of that discussion, suggested that not only were we now in a position to speculate realistically about the outlines of alien anatomy, but that we might also be able to hazard meaningful guesses about their psychology and their social arrangements. Again, I think that the key to this exercise lies in having a thorough understanding of the basic mechanisms of Darwinian evolution, as well as a critical knowledge of the accumulated findings within the social sciences, particularly in psychology, sociology, and history. 3 In The Dragons of Eden, Carl Sagan. argued that peaceful advanced civilisations – ones which were not, at least at their deepest levels, based upon a foundation of violent struggle and aggression – might exist somewhere out there in the Universe. This however, I think is a biological or rather evolutionary impossibility. 4 Given what we know about how Darwinian principles have operated throughout the evolution of life on this planet, it seems patently obvious that competitive struggles for survival have always been the driving mechanism of selective adaptation to existing and changing conditions on the planet. 5 The road to evolutionary viability (if you will permit me to mangle a well known homily), is paved with the corpses of unsuccessful adaptations. 6 No matter how well camouflaged, how well its buried beneath layers of dissimulation, competition generally requires some degree of aggression. To adapt Hobbes, life, and the process of living, in other words, is an unrelenting struggle, and one in which the fittest – the best adapted, and the most aggressive – tend to be the ones who propagate their genes the best. 7 Thus, what I am arguing is that aggressive competitiveness is built into the very foundations of the evolutionary process, and that it should come as no surprise if this aggression not only finds expression in the overt behaviour of living organisms, but extends beyond the purely biological sphere, and in the case of advanced social life-forms, into the culture and structure of their society as well. 8 This, of course, is not to say that less aggressive societies could not by definition emerge, but rather that if they were, for whatever reason, to emerge, they could only have done so in a state of total isolation from the more aggressive ones in their eco- system, and furthermore, that they would be able to survive only so long as they managed to maintain their isolation. 9 Cultural Darwinism As an aside, this is exactly what we see in the third world today: Cultures – and this includes many indigenous cultures – which for whatever reason have not fully actualised their competitive, aggressive evolutionary heritage (as have all the successful/dominant cultures on the planet), if not already gone, are well on their way to extinction. 10 There are countless examples of this. The natives of Tasmania, for instance were a people whose extermination was assured by an official, state-sponsored bounty, offered per dead indigene, and paid out by the colonising British government, to aid the blood-thirsty and land-hungry settlers in their farm-acquisition exercises. 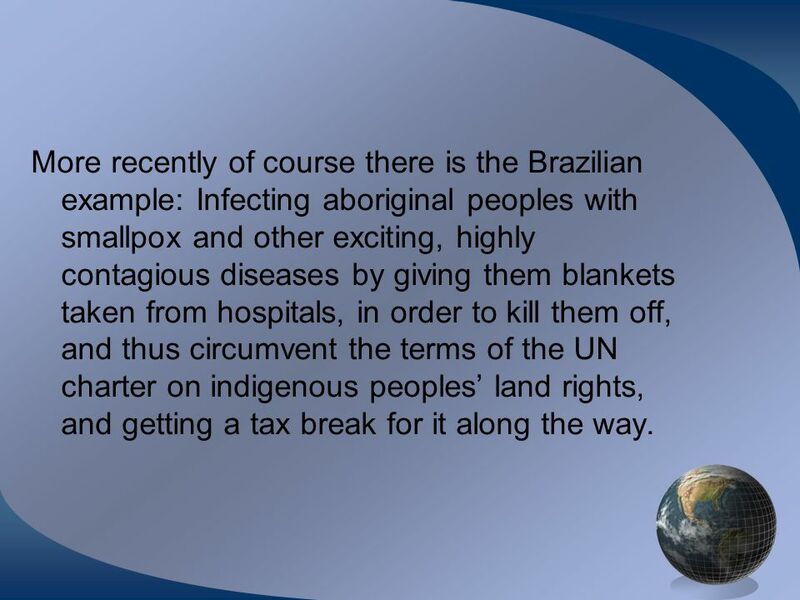 11 More recently of course there is the Brazilian example: Infecting aboriginal peoples with smallpox and other exciting, highly contagious diseases by giving them blankets taken from hospitals, in order to kill them off, and thus circumvent the terms of the UN charter on indigenous peoples land rights, and getting a tax break for it along the way. 12 What all this means for the UFO buffs out there, I suspect, is that if we ever do succeed in establishing contact with aliens, or if they ever do come to visit our planet (a most unlikely event given what we know about the laws of physics), they might be wearing peace signs, but are none-the-less going to be having their ray-guns handy as well. 13 They may be peaceable, culturally and legislatively, but will not have had a peace-fraught history. Put whimsically, it is more likely to have been the pursuit of weapons, than the pursuit of beauty which gave primary form both to their physiques, and to their social institutions. 14 As an aside, I notice that there is one point I have not addressed: If they are advanced life- forms, there is no question but that they are going to be social creatures: There are two reasons for this: 1) Linguistic; 2) Organisational. 15 1. Language and the associated abstract symbolic activity which is a sin qua non of intelligence does not occur in a vacuum. 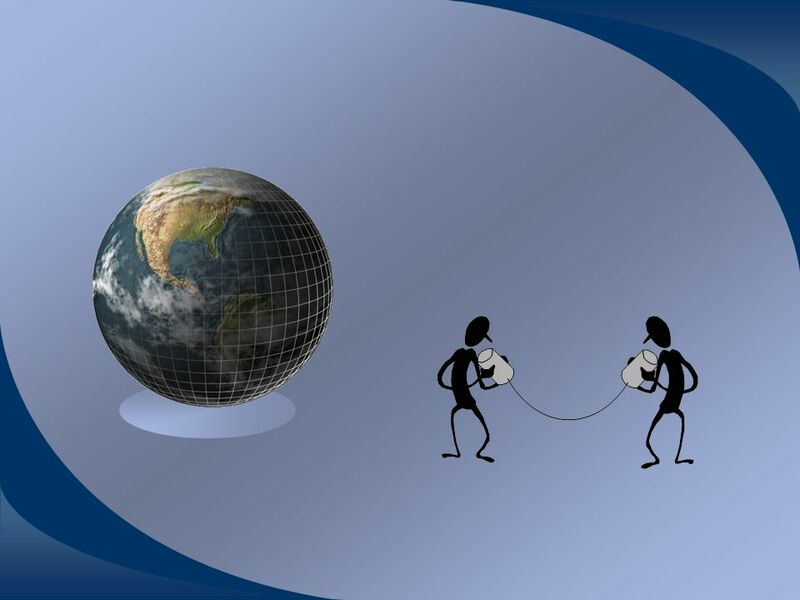 Without the need to communicate, the ability to communicate would not have evolved. On earth, this has often been linked to a carnivorous life-style, and to coordinated predation (lions, wolves & dolphins vs. sharks, crocodiles & snakes), though there are some herbivores (e.g. elephants) which for particular and specific reasons seem to have developed communication skills too. 16 Thus, they too would have developed some means of exchanging, and storing symbolic information (that is to say, they would have a language or rather languages of some sort - though whether it would be sound based is debatable, though sound does have the advantage of being omni- directional), and would have their own cultures. Furthermore, these languages and cultures are likely, just as they are here on earth, to be geographically, and racially determined. 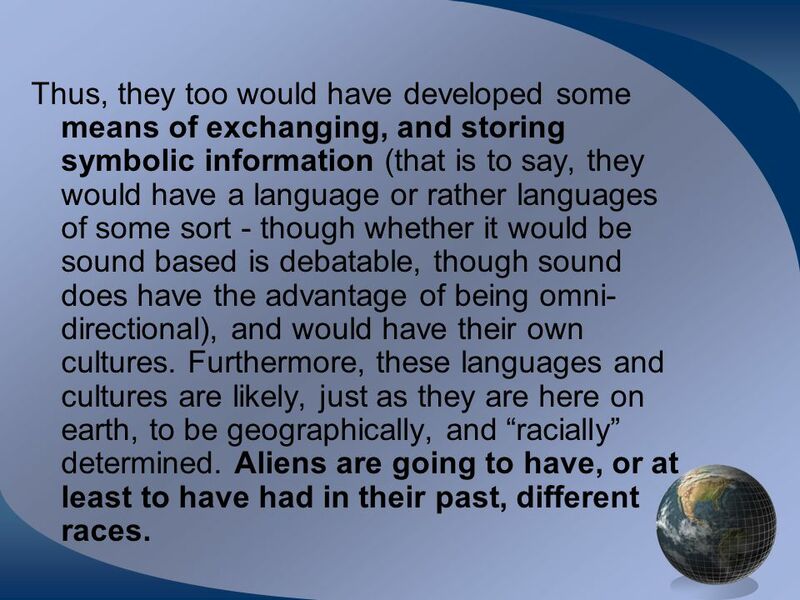 Aliens are going to have, or at least to have had in their past, different races. 17 2. 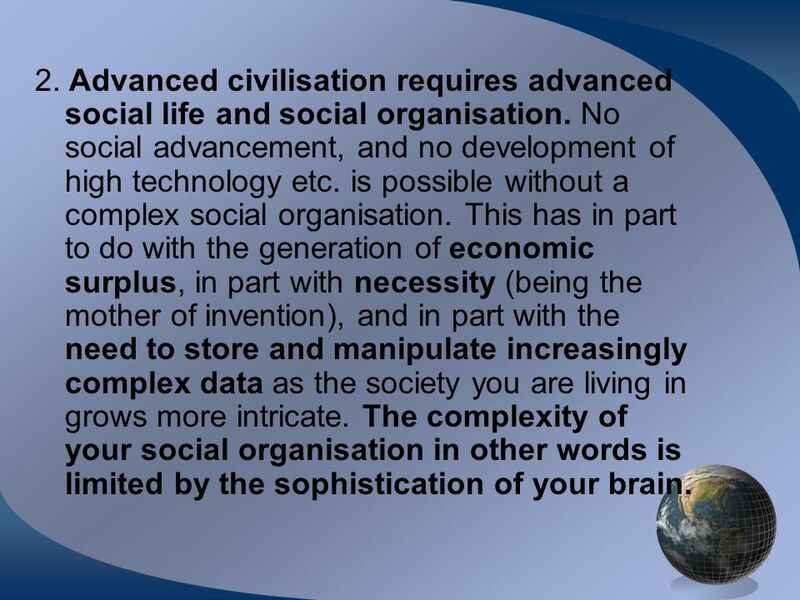 Advanced civilisation requires advanced social life and social organisation. No social advancement, and no development of high technology etc. is possible without a complex social organisation. This has in part to do with the generation of economic surplus, in part with necessity (being the mother of invention), and in part with the need to store and manipulate increasingly complex data as the society you are living in grows more intricate. The complexity of your social organisation in other words is limited by the sophistication of your brain. 18 Much like us their culture is going to be based on a genetic heritage of violent, aggressive, self- centred behaviour, which they would necessarily have had to learn to keep under control by a variety of social institutions (if they hadnt learnt to control it, they are likely to have wiped themselves out, or at least done so much damage to their social organisations and to their ecosystems that they would be unable to make enormous material progress): Cf. the material and technological progress made since the stability following the second world war). 19 Why would it have to be like this? Recall that aggressive behaviour is woven into the very fabric of the evolutionary dynamic, as I pointed out above, and note that if they had not learnt to keep these urges under control, they are likely to have self- destructed soon after their development of weapons of mass destruction. 20 Let me reiterate. I am not implying that biology/genetics is absolute destiny, nor am I defending aggression. 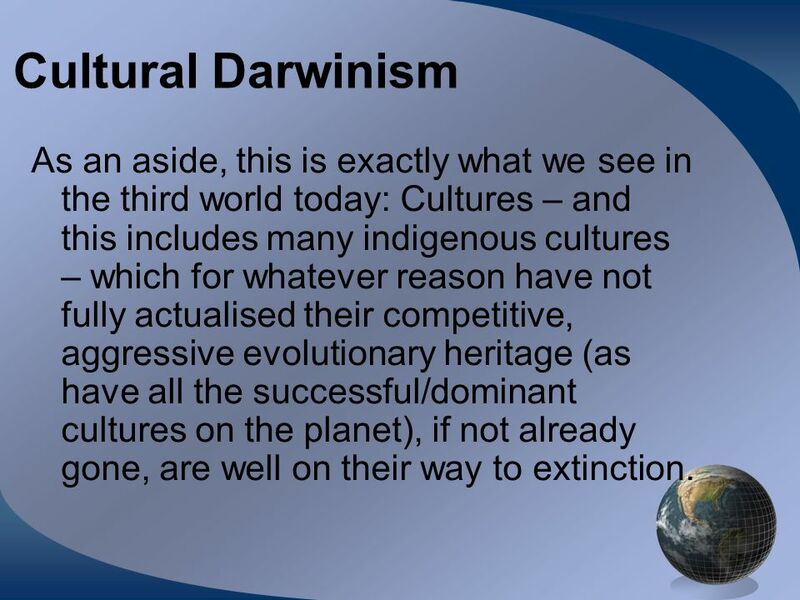 I am merely saying that this is the way it is, and that, evolutionary/biological/genetic factors may not be ignored. 21 Anarchists objections One seemingly plausible set of objections to the theme of unrelenting aggression outlined here is that raised by certain of the anarchists (e.g. Bakunin, Kropotkin, Goldmann, &c.): The roles of altruism and cooperation in social organisation, which have been well documented, and were the cornerstones of many anarchists theoretical oppositions to the bleak view of the unregulated state of nature taken by Hobbes. 22 Their arguments were that amongst certain species, a kind of altruistic behaviour seems, at times, to be displayed, and that sometimes an individual member of a group seems to act for the good of the group as a whole, rather than for itself, and also that in many species, individuals cooperate without any apparent personal advantage for the survival of the species as a whole. 23 The response: The selfish gene In fact though, this behaviour is still consistent with my theme of self-centred aggressive behaviour, since the functional goal of any behaviour is the propagation of the gene, rather than the individual organism Cf. The selfish gene & functionalism. In many organisms, this is achieved through outright competition, but under certain circumstances, cooperation, or even altruism is better (e.g. lions pride-, mating- and cub-rearing behaviours). 24 Alien life spans Most thinkers are agreed, there are 3 levels of information storage: 1. genetic; 2. extra-genetic (i.e. learnt); 3. extra-somatic (i.e. socio-cultural (cultural artefacts, writing, & cultural learning itself)) Thus, highly intelligent aliens are likely to have a long infancy, and to experience considerable cerebral growth/development after birth (like us) because genetic encoding of information, despite an impressive showing on earth, is still limited as a strategy for transmitting complex behavioural information. 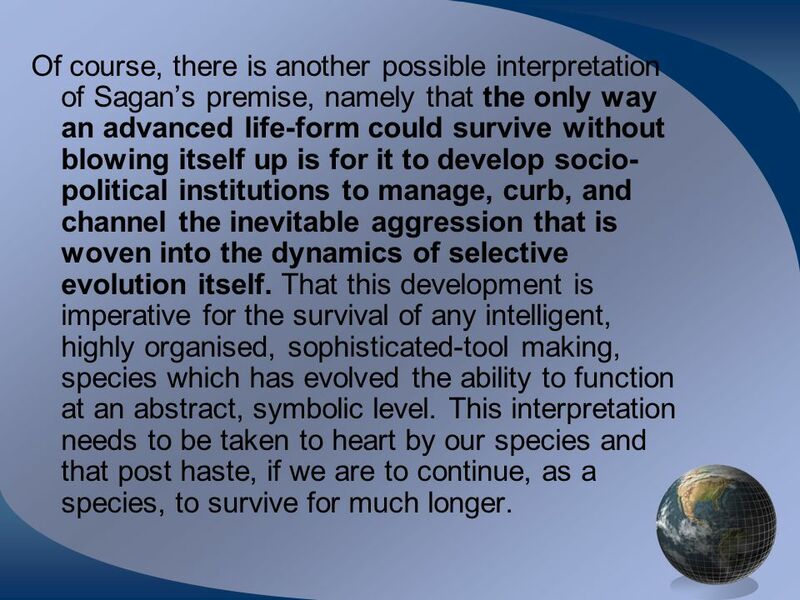 26 Of course, there is another possible interpretation of Sagans premise, namely that the only way an advanced life-form could survive without blowing itself up is for it to develop socio- political institutions to manage, curb, and channel the inevitable aggression that is woven into the dynamics of selective evolution itself. That this development is imperative for the survival of any intelligent, highly organised, sophisticated-tool making, species which has evolved the ability to function at an abstract, symbolic level. This interpretation needs to be taken to heart by our species and that post haste, if we are to continue, as a species, to survive for much longer. Download ppt "Exopsychology - E.T. Call home? © ss jothiratnam." The Philosophy of Exotischism An Overview 85 In the period following World War II there were many books and articles published that showed how. THERE IS NO GENERAL METHOD OR FORMULA WHICH IS ‘CORRECT’. YOU CAN PROBABLY IGNORE SOME OF THIS ADVICE AND STILL WRITE A GOOD ESSAY… BUT FOLLOWING IT MAY. READ CHAPTER 4.1 UP TO AND INCLUDING PAGE 67. READ CHAPTER 4.1 UP TO AND INCLUDING PAGE 67. WHAT DO WE MEAN BY SAYING THAT ACCORDING TO ARISTOTLE, THERE. Do Now Write the answers in your notebooks. 1. What is the difference between a genotype and a phenotype? 2. What are alleles? Biology 1b Evolution and Environment GCSE CORE Key words: change, disease, predator, competitor, climate change. This presentation introduces students to the anthropological definition and use of the concept of culture. It focuses on all of the aspects of culture. The financial imperatives of the entertainment industries and their impact on family bonds CAPITALISATION. L ECTURE 12: N OAM C HOMSKY. T ODAY ’ S L ECTURE In Today’s lecture we will: 1.Recap our investigation into Epistemology 2.Briefly outline the theories. The Costs of Sport-Hunting of Large Carnivores By Bertha Munuku Texas Tech University. The Philosophy of Exotischism Ignorance Is No Excuse 1 Most of us have heard the old expression "ignorance is no excuse for breaking the law". If courts. Understanding Educational Innovation Professional Practice Module Dr Sue Wharton. Sociocultural Evolution By Dr. Frank Elwell. Sociocultural Evolution Sociocultural materialism is an avowedly evolutionary perspective.